"Thanks so much for the discount code! 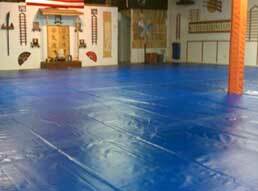 We use this tarp to cover mats at a Jiu Jitsu Academy. This tarp takes a beating every night. It holds up to blood, sweat, and tears! We have even made wall padding out of this tarp as well. 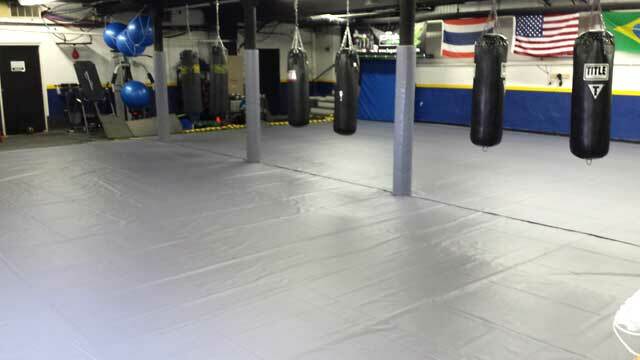 We just placed our order for a new tarp for our gym expansion.."
"I have attached some pictures of our mat so you can show it to your manufacturing team. 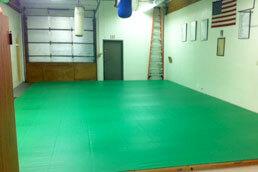 The mat looks wonderful in our center." "...we installed it over the weekend. It looks great! We tested it with a few throws and it works great, too. A very nice "foot" to the fabric. Great service and a pleasure doing business with you. " 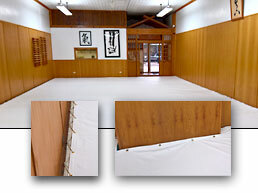 "I was thinking you might like to see the Mat Cover in our Dojo. I love it." 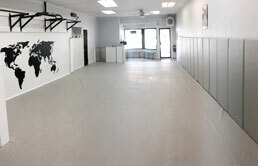 "Our mat area with the new canvas. Looks like heaven!" 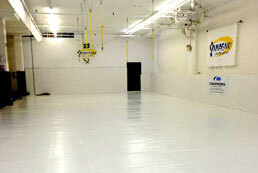 Vinyl: 18 oz/sq yd coated vinyl with heat sealed panels and raw edges. Canvas: 18 oz/sq yd natural or dyed cotton duck canvas. Blind French sewn seams, triple fold hems. "Cover is down and fits awesome!!!" 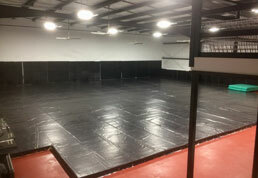 (1) set of 2-pieces sized: 22' x 37' 2" Light Gray ThoroShield 1850 Custom MMA Mat Cover 18 oz/sy coated vinyl w/ Velcro around entire perimeter (other 1/2 supplied as adhesive backed for customer's install on 2x4 frame) & (4) 8" diameter pole cut-outs measured on center from FRONT end (per customer supplied drawings) at 25.5", 157.75", 289.75", & 421.75" on 446" length; with 2" Velcro overlap dead-center thru poles; finished sizing. 33" x 72" Light Gray ThoroShield 1850 Custom Pole Wrapper 18 oz/sy coated vinyl with both 33" edges hemmed only and matched Velcro on both 72" edges (topside/backside) to attach panel as a cylinder shaped enclosure around padded 10" diameter pole.